My courgette plants are finally producing some courgettes! Not many, it is true, but let’s hope more will come. Anyway, I had to use them for something other than just sautéed courgettes as an accompaniment.I also had some tiny cherry tomatoes from the garden, so I decided to use those as well. 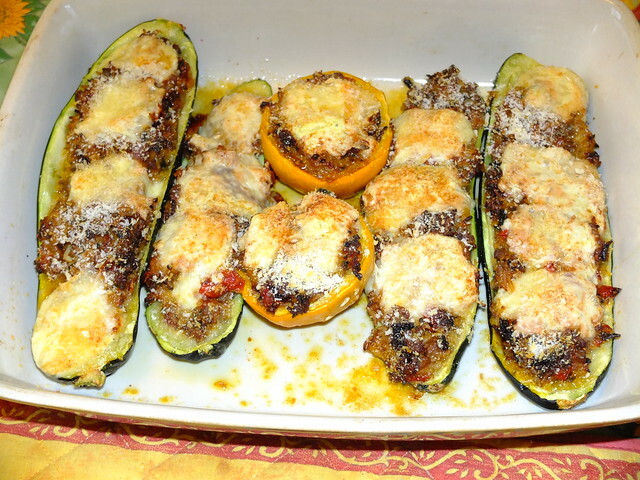 The plan was to stuff and bake the courgettes with a mixture of the courgette flesh, beef mince, rice, the crushed tomatoes, onions, garlic and spices and herbs. I scooped out the courgette insides and chopped this up. Then I fried some chopped onion and garlic until soft and added the courgette flesh and cooked this until it gave up a lot of its water. Then I added some beef mince and some Za’atar, a Middle Eastern spice blend and fried this for a bit before adding some basmati rice, salt and pepper, chopped parsley and the crushed cherry tomatoes. After this had cooked down for a few minutes, I added some vegetable stock and covered the pan and cooked it on a low heat until the rice was done and there was no liquid left. I stuffed the courgette skins with the beef mixture and topped off everything with some cheese and panko crumbs, drizzled olive oil over everything and baked it on a 160C oven until it was nicely browned on top.